Few housing markets are crazier than San Francisco’s. But what had to happen is starting to happen: while house prices continue to soar, a phenomenal building boom is causing a condo glut that will reach dizzying proportions as new condo towers are completed. And now the dynamics of the market have reversed. The median condo price — half sell for more, half sell for less – was $1,100,000 in the first quarter for sales reported to Multiple Listing Services (MLS) by April 5, according to Paragon Real Estate Group. Up 70% from the first quarter in 2012. But it’s down from $1,107,500 in Q4. Very unusual: the last time the median price did not jump from Q4 to Q1 was in Q1 2012, at the end of the last downturn. For example, over the same period a year ago, condo prices jumped 8.5%! While this left condo prices up 1.8% from a year ago, they’re down 2.3% from their peak in Q2 last year ($1,125,000). In the first quarter of 2016, various market segments in the city began to trend in significantly different directions. Houses, especially those below $2 million, are still often selling in a frenzy of bidding: Recent reports of houses selling with 5, 10 or more competing offers are not uncommon, especially in neighborhoods considered more affordable (by San Francisco standards). Demand remains very high, supply remains extremely low, and new house construction is virtually nil. Condos are a different story. The condo and rental apartment construction boom has reached feverish levels. The SF Planning Department’s Q4 Pipeline Report lists 62,500 units in the pipeline, from “building permit filed” to “under construction.” If completed, they’ll increase the city’s existing housing stock of 382,000 units (houses, condos, coops, and TICs) by over 16% [read… This Will Crush the Insane San Francisco & Silicon Valley Housing Bubble]. As of early April, the number of condo listings actively for sale in MLS is up over 40% year over year, and that does not include most of the new-construction condo units hitting the market (not listed in MLS). These condos often go into contract during the construction phase, long before sales actually close, and access to information during that period is very limited. There can be no doubt that they comprise serious competition to resale condos in the areas they’re being built. And luxury condos, where much of the new construction is focused, appear to be most affected. One of the key metrics in determining just how feverish the housing market has become is the median percentage of sales price over asking price. This metric deteriorated sharply for all categories since their respective peaks in Q2 and Q3 last year. At one end of the spectrum: houses under $2 million (black line in the chart below) still sold for a steamy-hot 12% above asking price. But that’s down from a breath-taking 18% above asking price at the peak in Q2. At the other end of the spectrum: luxury condos over $1.5 million (red line): the median percentage of sales price over asking price is now 0% (rounded from a “tiny fraction” above asking price). That’s the median. Hence, half the luxury condos sold below asking price! 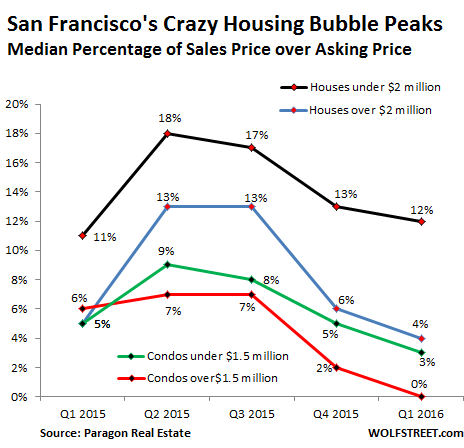 Another tidbit, though not shown in the chart: in areas of San Francisco where the luxury-condo towers are shooting up, according to Paragon, the median percentage of sales price over asking price turned negative, as the median sales price “fell well below” asking price. As bad as this looks, it does not include the surge of new units that have come on the market because they’re not included in the MLS data. But they will further pressure prices of resale units in future quarters. Also, today’s sales data reflects the market as it was a month or two ago due to the delay between when units are listed, when offers are negotiated, and when sales are closed. Much of the deterioration linked to the deflating startup boom in Q1 isn’t reflected in today’s data. It will show up in Q2. Perhaps nothing is more indicative of a cooling market than increasing numbers of listings expiring and being withdrawn from the market without selling. Q1 2016 saw big jumps in expired/withdrawn condo listings over the first quarters of the previous 3 years. Many such listings end up coming back on the market at lower prices. It’s chilling: for condos under $1.5 million, the number of withdrawn or expired listings soared 94%, and for condos above $1.5 million 128%! When these unsold units come back on the market, sellers nurturing any hopes of selling their condos will likely have to swallow a bitter pill: reduced asking prices. And this marks the point when the phenomenal, incredible, breath-taking San Francisco condo boom turns into a bust. 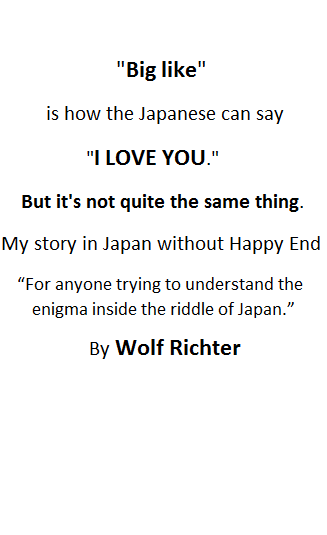 Wolf Richter Hi , I’m Spanish and I read your web . Congratulations is very good. Yesterday, Janet Yellen was saying that we are not in a bubble. He’s right. This is not a bubble , it’s an atomic bomb . NO we are not in bubble, except for real-estate in some USA cities, which on other hand is foreigners money, so who cares. Chickens will come home to roost very soon. You guys in Europe have to pay attention, you are not just inflated but deep in it to your necks. So watch out when SHTF on your side of the pond. Usually ends in bloody war. Where do all these immigrants live in S.F.? It is sanctuary city with hundreds of thousands of people who don’t have that kind of money, so, I can’t figure out where they find houses? What about teachers? Office workers? Good question. In SF, it’s called the “Housing Crisis” for a reason. There is now a city council move underway to bar landlords from evicting teachers during the school year because they can’t find another place to live anywhere near that they can afford and so they have to leave the area, thus disrupting the education of our kids…. I am surprised so far no company has pulled the ultimate coup: rent or buy an old cruise ship, anchor it in the Bay Area and rent out the cabins as apartments. If the aircraft carrier docking facilities at Alameda are still in place, that’s one problem taken care off, otherwise one can get creative, like the Brits did with Mulberry harbours: if they were good enough to defeat Hitler, they are good enough to defeat high rents! With cruise passengers becoming more and demanding, old ships that cannot longer satisfy them invariably end up in Pakistan and India to be broken up for scrap metal… I am sure they can be obtained for cheap. The rest writes by itself. Gentlemen, we have an idea. Now all we need is a group of venture capitalists! Ha ha…..Just like the old, decrepit, mastless British hulks of the 18th century, we have to house the poor vermin….before ‘transporting’ them to the neo-antipodes…am I right?? We will never have housing price declines in San Francisco because the Fed has assured us we are not heading towards a recession. it’s been contracting since 2000! Chinese buyers will snap up the newly constructed condominiums and leave them unoccupied, most likely? while sending those poor american souls to the neo-antipodes (Chinese ghost cities) I mentioned above! Can’t wait until they ‘discover’ my little neck of Oz!!! By the way, when is the next installment of the sky is falling in Australian Real Estate due? We looked at a few condos in November or December as we were house hunting. Our experience fits with the trend you mention. One thing we looked at was asking 1.7 million built in the 1960s with nice views of the downtown skyline from the top of Noe Valley. We were never serious about it since it was way out of our price range among other things, but wanted to see if any condos seemed attractive to us even in the more ideal circumstances for us (aside from price). The listing agent was seriously entertaining offers below $1.5 million, more than 12% under asking (and still insane, imo). Perhaps they grossly mispriced it, but I saw info about similar things selling for prices like that 6 months or a year before. I think condo prices have been weakening since last Fall at least. This one had been on the market for a while whereas most houses we saw sold significantly over asking with multiple competing offers, often multiple cash offers. I’ve felt condos in San Francisco have been really overpriced for a while since they have a much smaller land footprint per dwelling than most single family houses and yet often sell for as much or more than them without a comparable land cost. I suppose a lot comes down to location in the most trendy neighborhoods with lots of foot traffic and tech bus stops nearby where not much but condos is available for those who absolutely need to have the lifestyle of that neighborhood. I’d expect the prices to weaken even more in some neighborhoods as tech startups become unable to raise extra rounds of free money for often revenue-less products and may start running out of cash to pay their “rock star” employees. She owes $100,000 on her student loans. Yeah how do regular working people live in SF? Does the landlord receive the subsidies? Who pays the subsidies? Mark, I fully understood what you meant as a Bay area resident. Ordinary families are suffering here without any doubt. They either become the slaves to the banks as home owners or slaves to the landlords as home renters. No other choice. It’s all about location. Marin General isn’t exactly a giant research hospital. Here in San Jose, we are recruiting for nurses that we can’t find enough of. Nursing salaries at Valley Medical Center top out close to $200,000/yr. It’s easier to pay rent if you are making six figures, and she can get back into CalPERS for retirement. If the FED would raise interest rates on a gradual (.25%) yet STEADY course towards normalization 1% above inflation this would be good for investors, bad for speculators, and of course bad for debtors who have little to no chance of paying off their debts. Oil speculators included, commodity speculators included, all speculators included. Money without interest has little value. Sweetest milk from the county teat, push everyone else away and never grow teeth. The best groomed parking lots with the newest cars in my county are county buildings, and the largest single employer. Detached Housing is peaking all across the bay area, from San Francisco down to San Jose, the prices are about the same. East bay is still affordable but there are part that are so bad. There are parts of SF just as bad but housing and The speculators, Chinese and yuppies are the only thing keeping things going, a good old fashion recession should bring things back to normal. I live in the in the east bay and it in not affordable. Not affordable, even for a household of 20 occupants? Most landords will not rent 20 to a house, unless its an 8 bedroom home. I hope this spooks the Vancouver RE speculators and bursts that epic bubble as well. Teachers priced out of the market? Shamefull. wow – median prices came down $7,500 from last quarter! I know every financial writer wants to be the first to “spot” a bubble bursting, but to my eyes this looks closer to a stabilization than a bubble bursting. There is no “stabilization” or “plateauing” after huge run-ups in RE prices. Last time, they were also talking about “stabilization” and “plateauing,” famously, even as the RE bubble was already imploding. And also, it’s probably helpful to read the rest of the article – because the reasons aren’t focused on the price decrease but on the deteriorating dynamics of the condo deals and on the condo supply glut. A STAGGERING 0.62% drop! The sky is falling!! The sky is falling! And no, the sky isn’t falling. What will fall though are condo prices. You may be right. The .62% drop may be the canary in the coal mine, but not necessarily. Housing is directly driven by the job market, so the real issue is whether the job market in SF in both new job creation and salary growth will continue to grow apace with the increased construction. This is not the 2008-2009 mortgage collapse and deep recession, nor is it the earlier internet bubble. Job growth continues to be strong throughout the Bay Area and there is little price relief in housing elsewhere around the Bay. Your other indicators may be more a reflection of Sellers’ expectations having gotten ahead of the market, rather than the market itself declining yet.